Work with our professional web consultants to design and create a site that reflects the attitude and vision you want to project to the world. Our web developers and graphic designers will combine the aesthetic elements you want with the functional elements you need to create a beautiful and useful Internet presence for your business or organization. Quick and Easy Updates: You can manage all of the site content, and many of the site layout and design features, using the CMS (Content Management System) control panel built into every one of our site designs. Fast Data Access: Your site is easily updated because information for the pages is stored in a database (SQL, MySQL or MDB) rather than in static pages. 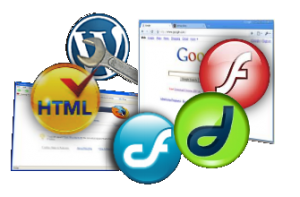 This allows you to perform updates through the CMS control panel, rather than editing and uploading pages using FTP or Dreamweaver access. 85% of all web surfers use one of three browsers. We develop our code using dynamic positioning so it will look the same on most of the currently available platforms. Just to be sure, we run a set of final test views on multiple platforms during the development stage.